Sadly, the college wrestling season is over. However, that doesn’t mean the end of articles on college wrestlers. In the past week, there have been a number of feature stories speculating on which wrestlers who are wrapping up their collegiate mat careers might be considering a move to professional mixed martial arts. Among the sources for the stories: ESPN.com … MMAsucka.com … and an InterMat Platinum premium subscription feature from senior writer Richard Mann. Before we name any names of potential MMA superstars, there are some basic issues these articles raise. For starters, some would-be MMA fighters want to explore all their options before stepping into a cage or the Octagon. Arguably the biggest potential detour for any top amateur wrestler before signing a contract with UFC, Bellator or any other MMA promotions anywhere in the world: the 2020 Tokyo Olympics. Ask just about any top collegiate wrestler to describe his ultimate career goal, and he’ll say, “Standing on the top step of the medalists’ podium, being presented with an Olympic gold medal while our national anthem is being played.” In some of the write-ups about potential MMA stars, the sportswriters name names of those who may be standing in the way of Olympic glory for that particular wrestler … with the thought that perhaps that athlete may decide to trade in his singlet for fight shorts now, and experience lucrative paydays much sooner than later had he moved on to international wrestling competition first. “But 15 years ago, when Askren was starting his illustrious Missouri and international wrestling career, many in his community thought MMA was a violent corruption of their craft and only begrudgingly accepted that it was a new career path for the best wrestlers. “‘That was still the dark ages of MMA,’ Askren says. And, while Askren admits to ESPN that there are more opportunities for former college mat champs to pursue an international wrestling career and earn a living at the growing number of regional training centers, these facilities cannot match the potential earning power of a pro MMA career. So … what elements does a college wrestler need to find fame and fortune in MMA? Each writer appears to have his own unique criteria. “Every senior we watched at NCAAs this year could be beyond successful, but here is a short list of the guys with fun styles and championship potential,” wrote MMAsucka.com. “This list focuses mostly on wrestlers who have the ability to get clean, sudden takedowns. This style of wrestling bypasses a lot of jiu-jitsu based scrambling that may spell trouble for some. It also points to the specific athletic potential they possess. So … who made these lists of NCAA wrestlers most likely to enter MMA? 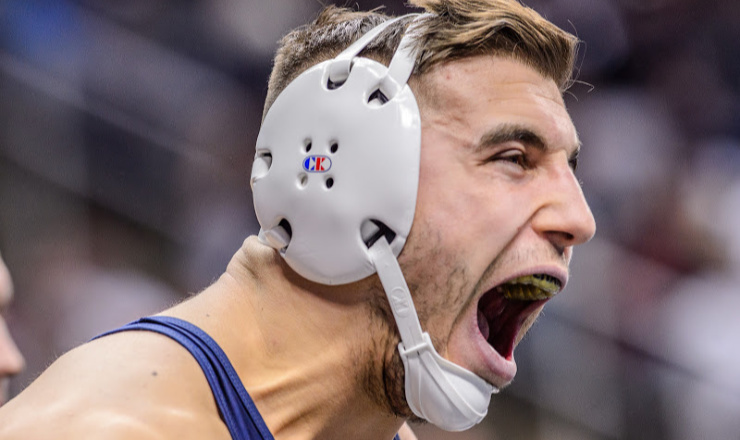 Among the individual champs crowned at the 2019 NCAA Division I Wrestling Championships in Pittsburgh a couple weeks ago who were presented as potential MMA stars in at least two of the three articles cited here: Anthony Ashnault, 149-pound champ for Rutgers … and Penn State’s Bo Nickal and Anthony Cassar, champs at 189 and heavyweight, respectively.